Thank you for visiting our site. We are the newest private resort and venue in Antipolo Rizal for all your swimming parties and all kinds of events such as Debut, Wedding, Baptism, Team Building, Church or Corporate events or a night of barkada hangout. 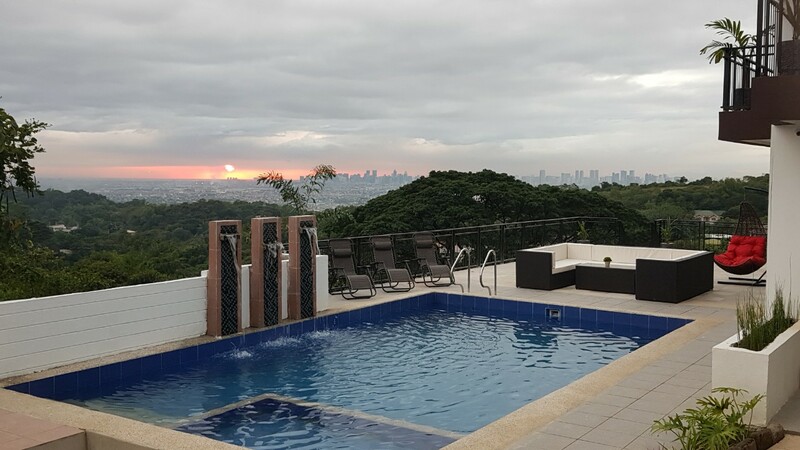 Enjoy the magnificent view of Sunset overlooking the skyscrapers of Metro Manila and Laguna de bay. Choose your own catering company, we do not charge a corkage fee. Billiard Room available free of use by Feb 2019. • A minimum of 50% down payment is required to book a time slot. The down payment is not refundable. Please contact us to check on availability and reservations. We’d love to hear from you. Call/text us at +63-927-966-5597 or use the form below to reach us. Antonino and Reinalyn's Wedding at Tyvo Resort! Catering by Ignacio's Catering Services, Video/Photography by SGT Photography, Lights/Sounds by M.I BoxFilm, Hosted by Sweet Treats by Rory, Coordinated by Sweet Treats by Rory. Thank you choosing us to be part of your memorable day Antonino and Reinalyn. Tyvo Resort is a private resort and venue provider featuring a spectacular overlooking view of the skyscrapers of Metro Manila and Laguna de Bay. We feature a grand staircase perfect for Debut and wedding. We also have a Grand KTV room and a Billiard/Game Room for added enjoyment all included in our very affordable rates. Not just a swimming party but a grand party! Tyvo Resort added 3 new photos — at Tyvo Resort.